MORE than two weeks after the dreadful event, we are still gripped by the images of destruction and devastation wrought by the earthquake and tsunami in Japan. They were like disparate scenes from some disaster movie—skyscrapers swaying as the ground beneath shook, people inside offices trying to steady themselves and the precious equipment around them, and oh that horrible, horrible wave of dark water rushing like some evil giant monster eating up farms and obliterating homes and buildings that stood in its path. 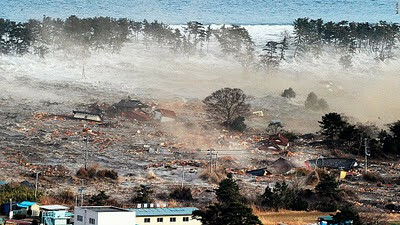 We have been moved with sadness and empathy at the many lives that have been lost, grieve with the people shown going back to what used to be their homes just smashed into a pile of toothpicks, and wait for every update on the Dai-ichi nuclear power plants in Fukushima, Japan, which has been battling a possible meltdown. Once in a while, there is some rejoicing. We applaud as we watch news footage of families finding each other after the calamities, and thank God for those who have miraculously survived and have been rescued from their homes. I just cannot help but admire the Japanese and their grace—as one reporter dubbed it—through their suffering. They remain calm and composed through it all—not stoic as some foreign parachuting journalists aver (the Japanese do cry, you know)—and wait until they are attended to. In each place gravely affected by the twin calamities, victims were even quick to apologize to rescue workers about being “a bother,” encouraging the latter to take care of other victims who may require more assistance than they. Even in urban areas which were only slightly affected by the earthquake, there was no mad rush to get ahead of the line when buying groceries at the few remaining open supermarkets. There were no complaints that food, water and fuel had to be rationed due to supply disruptions. And always, the respect for other people’s properties remains. There was neither looting nor stealing just to ease one’s discomfort. 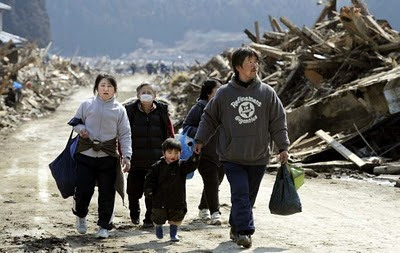 GMA News TV’s Chino Gaston, who has so superbly documented his experience amid the devastation in Sendai and his observations of the Japanese as they try to recover from the disaster, tells of the time he innocently asked his local driver if it was possible to siphon the fuel from the ruined cars strewn about by the tsunami. I suppose it was because their own service vehicle was running low on gas, and they still had a long way to go. When they did finally run out of fuel, the local driver remained behind as Gaston transferred to another vehicle. The driver, like his other countrymen, probably waited until rescue workers came along, or walked to look for a place to get some gas. He probably did not even bother to lock the car, the thought of anything inside being stolen not even occurring to him. And although a recent piece in a Japanese newspaper did report on one bank losing its money to thieves because the tsunami destroyed the building and its security system, I believe this was more an anomaly than the norm in that country. What kind of people are they, these Japanese? Already hurt and in dire need of rescuing, they still think of others first before themselves. It just hurts to see them behave this way. It hurts because it puts most of us to shame. I am embarrassed to say that if I probably ever find myself in the same situation as the Japanese, I will probably do everything to get my family and myself saved by rescue workers first. I will use all my family connections, as well as my media and government network to get the food, the water and the fuel for my family to survive. We absolutely cannot go hungry and cold in such a time. No one wants to suffer. And no one wants to suffer any more than one’s neighbors, when placed in similar dire straits. So, yes, selfish as it may sound, pretty much everyone around here would probably react similarly in stressful situations that threaten one’s survival and that of one’s family’s welfare. The one overriding impulse would be to save one’s self. I don’t ever wish for something like what happened in Japan to happen to us. I fervently pray all the time that our country be spared such horrendous suffering, because our country not only does not have enough resources to rebuild, but I don’t think my family and I will actually survive a disaster like that with our sanity intact. I wish we were all wired the same way as the Japanese. Just look at their elderly who have lost their families. They are still talking about rebuilding their lives! Such serenity and hope. We could do well to emulate them—these superhumans. But I am realistic enough to know that when push comes to shove, it will probably be every man for himself around here. I just hope I am wrong.